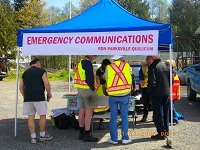 Volunteers are the lifeline of RDN Emergency Planning and response. During an emergency evacuation the RDN relies heavily on Emergency Social Service teams throughout the region to help provide shelter, food and clothing, and other services for evacuees. Volunteers also play a key role in the deployment of local fire crews, search and rescue, and emergency amateur radio communications.